Maintaining a healthy lifestyle is highly important,and this is mainly about getting right exercise,enough sleep and maintaining a healthy diet. It may look hard enough for some people,but what happens when the food we eat doesn’t fuel our body. Diabetes prevents the body from processing the food into the fuel we need for effective functioning of the body. One’s family history,body weight and age also play a crucial role.Diabetes mellitus is a condition causing high blood sugar level due to relative or total deficiency of insulin. Insulin is a hormone secreted by beta cells in the pancreas. Type 1 Diabetes, one of the two major types of diabetes is also called juvenile diabetes. It is mostly found in children and young adults. Type 2 Diabetes affects adults almost exclusively,but of late,it is being seen even among youngsters,due to rise in childhood obesity. Primary symptoms for both of the types of diabetes are thirst,frequent urination,blurred vision,increased appetite and fatigue. If you ignore the early warning signs of diabetes,it gets worse with more complications. If left untreated, diabetes can cause a number of problems such as kidney damage,increased risk of heart attack and stroke,diabetic nephropathy,diabetic neuropathy,and diabetic ulcers. Homeopathy is based on the principle that disease is a total affliction of body,and recognizes the underlying causes such as genetic and inherited factors as the root of any ailment.Hence homeopathic treatment is very effective for chronic diseases like diabetes.Type 2 Diabetes is a constitutional disorder of the body,and impacts an individual completely.This emphasizes the need for an in-depth constitutional approach like homeopathy for its management and Homeocare International has helped individuals to manage diabetes and lead healthy lives. 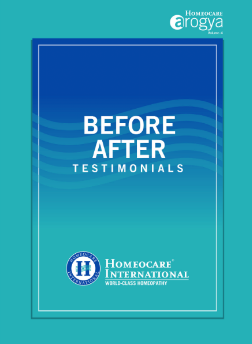 I took homeopathy treatment for 8 months, I’m very happy with their quality treatment.